Last fall I ran across a recipe by David Tanis for Rigatoni & Cauliflower al Forno. Almost everything about this recipe appealed to me. Pasta…. Caramelized and highly seasoned cauliflower… Cheese…. Toasted breadcrumbs… To top it all off, the recipe was created by one of my favorite chefs. What’s not to like? When I finally got around to trying it out, I discovered that there was one thing about the recipe I wasn’t crazy about. Because there isn’t really any added moisture (in the form of a béchamel or some other simple sauce), the noodles dried out a bit in the oven. Most of the dish had what I would call a pleasantly chewy texture, but there were some bits that were downright crunchy. There’s nothing wrong with this…. It’s just not really what I was looking for. On the other hand, I found the flavors of this pasta to be fantastic. I liked them so much that I wanted to reinvent the dish in such a way that the textures would be more appealing to me. I then forgot about it until I ran across a recipe for bucatini with sautéed cauliflower, lemon and capers in the February issue of Martha Stewart Living. The method of the Stewart recipe reminded me a bit of sautéed cauliflower pasta I posted here a couple of years ago: The seasoned sautéed cauliflower is simply tossed with freshly cooked pasta, some of the pasta water, and a final drizzle of oil. And this is basically how I made my adaptation of David Tanis’s original recipe. One of the things I loved about the “al Forno” version of this pasta was the delicious bits of stretchy cheese. To get this effect in my simple dressed and tossed pasta, I added fresh buffalo mozzarella, off the heat, just before serving. I’m not fond of fresh mozzarella in things that spend a long time in the oven because it seems to cause the cheese to harden and separate. (In the original baked version I used Fontina. If I had used Mozzarella, I would have used a low-moisture style, which has excellent melting qualities.) But tossing chunks of the fresh mozzarella (torn in pieces if soft, diced if on the firm side) in with the hot, dressed pasta provides just enough warmth to soften the cheese and bring out its wonderful stretchy quality. I was very pleased with my adjusted version. It retained all of the lively flavors of the original, but had the texture that I prefer. In the end though, both are very good….and others might prefer the crunchy-chewy effect of the original. If you like caramelized cauliflower, you will probably like either one…which is a good reason to plan on trying both. Half of a medium cauliflower, about 3/4 lb. Toss the bread crumbs with a couple of teaspoons of olive oil and toast in a 375° to 400° oven until golden and crisp…stirring once or twice…about 5 to 7 minutes. Set aside to cool. Toss with half of the parsley. Lay the cauliflower cut side down on the cutting board. Slice in scant 1/4-inch thick slices. You will have slices of varying size cross-sections and small bits of floret when you are done. Warm 1 1/2 T. olive oil in a large sauté pan (the pan should be large enough to hold the cauliflower in a shallow layer—if it is piled to high it will steam rather than sauté) over medium-high to high heat. Add the cauliflower to the pan…you should hear an active sizzle. Allow it to cook undisturbed until the edges are beginning to brown—about 2 minutes. Give the cauliflower a toss to redistribute and leave it alone again until you can see that the edges are beginning to brown. If at any time the cauliflower looks dry, drizzle a little oil around the edges of them pan. When the cauliflower is nicely splotched with golden brown (it’s fine if some pieces don’t brown evenly) —after another 2 to 3 minutes—season with salt and reduce the heat, continuing to cook until the cauliflower until the cauliflower is easily pierced with a fork. (It should be tender, but still have texture.) This will take another 5 to 7 minutes. Season the cauliflower generously with salt and pepper. Add capers, garlic, red pepper flakes, chopped sage, and lemon zest and stir to coat. Let cook for a minute or two…adding another drizzle of oil if the pan seems dry…until the seasonings are sizzling and fragrant. Set aside—off of the heat—while you cook the pasta. Drop the pasta into a large pot of rapidly boiling, salted water. When the pasta is al dente, drain, reserving some of the pasta water. Return the pan of cauliflower to medium heat and add the pasta. Toss to combine. Add a half cup of the past water. Toss again. Off the heat, add the remaining parsley, a generous drizzle of olive oil and the mozzarella and toss until the mozzarella is evenly distributed and just beginning to soften. Taste and correct the seasoning. Divide the pasta among 2 or 3 serving plates. 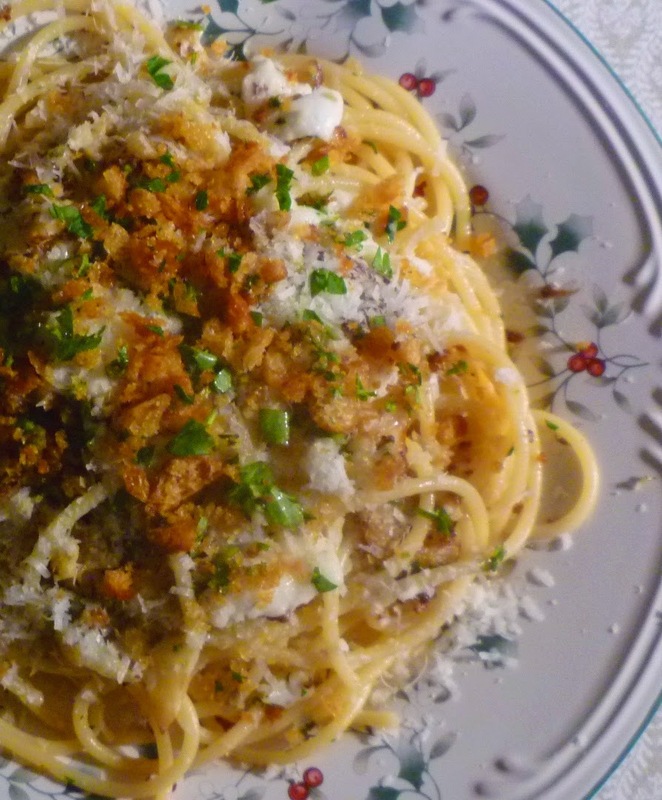 Top with the bread crumbs and the Pecorino. This recipe may obviously be doubled to serve 5 or 6. Unless you have a very large sauté pan, you will need to sauté the cauliflower in two batches.…and will be better off tossing the finished and seasoned cauliflower with the pasta in a large bowl, or in the pot the pasta was cooked in.